The Tomsk State University of Control Systems and Radioelectronics IEEE Student Branch was formed in 2000. It is the 3rd IEEE Student Branch in Russia. The branch is active in promoting the IEEE through exciting and informative events ranging from technical seminars to careers events as well as professional conferences. We hope that these events help our members gain valuable knowledge and skills as well as being enjoyable. The Tomsk Polytechnic University IEEE Student Branch was formed in 2000. The branch is active in promoting the IEEE through join events with TPU and TUSUR, and professional English tutorials. We hope that these events help our members gain valuable knowledge and skills. We trust you will enoy both professionally and personally from our activities. The Tomsk Joint AP/COM/ED/MTT/EMC Chapter was established in 2000. 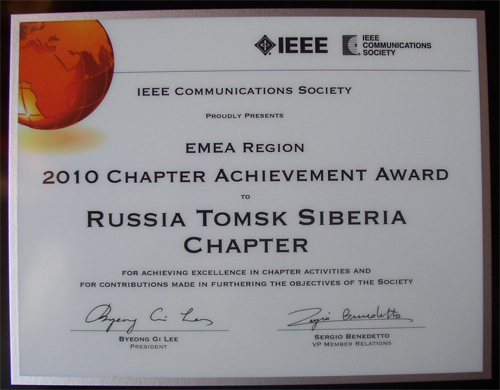 We are active in promoting the IEEE membership among researches in Tomsk and all Siberia. The Chapter established and take place the International Siberian Conference on Control and Communications. This conference is very representative in Siberia on fields of control, communications, radar, electron devices. Chapter is the only carrier an idea of membership in scientific societies, in particular, IEEE. Join the IEEE – it is a good Institute! IEEE Communications Society provides us technical and financial support, co-sponsorship of our conferences, website hosting etc. Thank you, ComSoc! As acknowledgement we translate some interesting information about ComSoc to Russian. Join the ComSoc – it is a good Society! IEEE Electron Device Society provides us financial support, technical co-sponsorship of our conferences, publications, participation in Chapter Chairs Meeting etc. Thank you, ED-S! Join the ED-S! IEEE Microwave Theory and Techniques Society provides us technical and financial support, co-sponsorship of our conferences, publications, participation in Chapter Chairs Meeting etc. 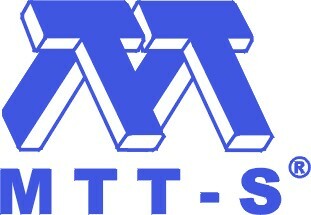 Thank you, MTT-S! Join the MTT-S! We always receive questions concern IEEE benefits, forming a Student Branch, Chapter etc. Frequently Asked Questions, Nuts and Bolts please see here or in special part of this site in Russian. Tomsk Seminar "The Intellectual Systems of Modeling, Design and Control"
We offer some books, tutorials, and courses for self-training and career development. Please see complete list of books and tutorials. The art of scientific writing for post-graduates: practical tips. Textbook. – Tomsk: Tomsk State University of Control Systems and Radioelectronics, 2000. – 150 p.
This is an exceptional book. It walks the reader through all stages of writing an abstract. We have worked with some excellent writers and re-writers on papers, but this book lays out for all of us what some top writers may do by instinct. Here is a book for anyone who would like to become better with a modern style of professional English. Following our rules, from sentence to paragraph to section, creates a paper that invokes an instinctive sense of clarity in the reader. The Student Branch & Chapter Committees held regular meetings to discuss a wide variety of topics including future events, branch aims, progress, challenges and finances. If you have anything that you would like to be discussed in our next committee meeting, please contact us. The minutes from our meetings can be found here. The Institute of Electrical and Electronics Engineers (IEEE) is a non-profit organization, and is the world's leading professional association for the advancement of technology. There are more than 420,000 IEEE members in over 150 countries around the world. IEEE members are engineers, scientists and allied professionals whose technical interests are rooted in electrical and computer sciences, engineering and related disciplines. The IEEE publishes nearly a third of the world's technical literature in electrical engineering, computer science and electronics. This includes about 140 journals, transactions and magazines and over 1400 conference proceedings published annually. IEEE journals are consistently among the most highly cited in electrical and electronics engineering, telecommunications and other technical fields. Each year, over 100,000 technical professionals attend the more than 1900 conferences sponsored or cosponsored by the IEEE. From microelectronics and microwaves to sensors and security, IEEE conferences cover relevant topics that showcase the depth and breadth of members' technical fields. The IEEE is a leading developer of international standards that underpin many of today's telecommunications, information technology and power generation products and services. Often the central source for standardization in a broad range of emerging technologies, the IEEE Standards Association has a portfolio of some 900 active standards and more than 400 standards in development. Please recognize information on the benefits of becoming a member of the IEEE.